Stanley hot-dipped galvanized steel door panels with polyurethane insulated core. Required rough opening is 61.125" x 83.375"
Stanleys Bellochio contemporary glass collection features a faceted eye framed by four light Flutex glass panels and edged in dazzling diamond glass with patina coming. It provides an entryway that is dramatic while affording a high degree of privacy. You and your guests will be delighted with the sparkling interplay of reflections this pre-hung steel door creates under a spectrum of lighting conditions. These durable steel 36 in x 80 in pre-hung entry doors will enhance the value and beauty of your home. Double bored, the door can accept a lock set and deadbolt of your choice. PLEASE ALLOW 2-3 WEEKS FOR DELIVERY AS THE DOOR IS CUSTOM MADE. When only the utmost in sophistication and security will do, the Blacksmith design combines a tempered, acid etched back glass with intricately detailed ironwork. The result is a stunning decorative glass that is both beautiful and secure. These durable steel 36 in x 80 in pre-hung entry doors will enhance the value and beauty of your home. Double bored, the door can accept a lock set and deadbolt of your choice. PLEASE ALLOW 2-3 WEEKS FOR DELIVERY AS THE DOOR IS CUSTOM MADE. Clear beveled half moons are just one feature of the attractively patterned Florentine series. Rounded out with complementary textured and beveled glass and a distinctive coming pattern, this insert has a traditional yet modern feel. 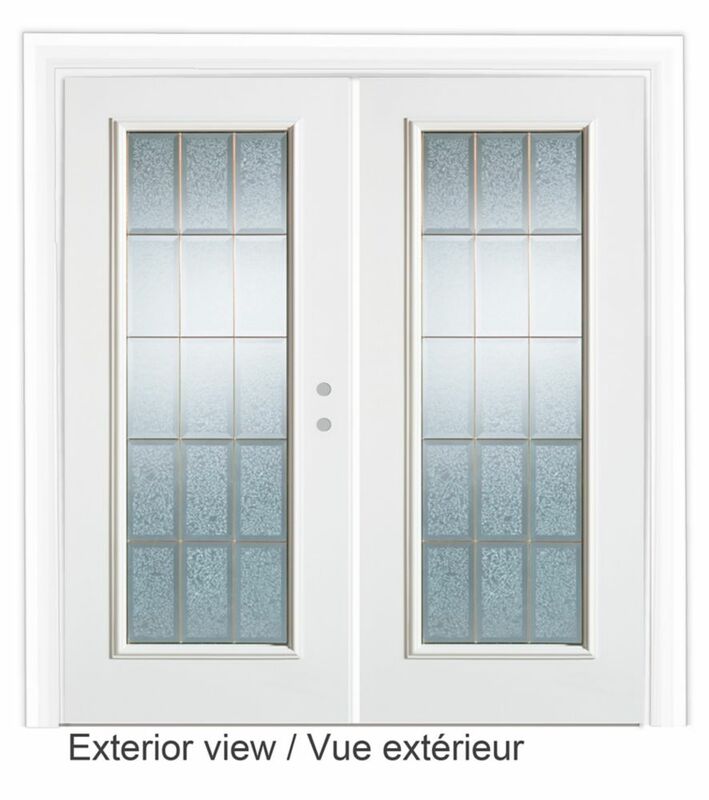 These durable steel 34 in x 80 in pre-hung entry doors will enhance the value and beauty of your home. Double bored, the door can accept a lock set and deadbolt of your choice. PLEASE ALLOW 2-3 WEEKS FOR DELIVERY AS THE DOOR IS CUSTOM MADE. The delicate art of silk-screening on glass is expressed to great effect in the beautifully detailed floral pattern of the Matisse series. These durable steel 36 in x 80 in pre-hung entry doors will enhance the value and beauty of your home. Double bored, the door can accept a lock set and deadbolt of your choice. PLEASE ALLOW 2-3 WEEKS FOR DELIVERY AS THE DOOR IS CUSTOM MADE.